Mesothelioma is actually a blanket term of different types of cancer. Mesothelioma itself comes in four different types. Furthermore, there are different types of mesothelioma cells. Pleural mesothelioma is the most common form. It affects the lining of the lungs specifically. It is usually asymptomatic in its early stages, although some patients report persistent pain in one part of their chest, fever, and weight loss. Once the disease progresses, more severe symptoms start to be present as well. Unfortunately, mesothelioma is one of the few cancers that cannot be diagnosed through serum markers, which means it is often overlooked. The survival rate of pleural mesothelioma is very poor. Only 8% survive between three and five years, with most of them passing away within 12 to 18 months. Treatment is mainly palliative, although it does depend on the stage of the cancer. If caught early enough, chemotherapy, radiotherapy and surgery may be offered. The prognosis for peritoneal mesothelioma is very poor. On average, patients survive from Mesothelioma cancer 10 months from when they first experience symptoms, which is often some time before they receive a diagnosis. However, there are some varied outcomes, with some surviving for much longer. In terms of mesothelioma treatment, very few options exist. This is also due to the fact that the cancer tends to spread very quickly. However, heated chemotherapy has shown some good results. Pericardial mesothelioma is almost exclusively treated with palliative care. Because the tumors are located so close the heart, it is all but impossible to remove them through surgery. This is the rarest form of mesothelioma of all. It develops in the lining of the testes, which is the tunica vaginalis. As such, it exclusively appears in men. Less than 1% of all mesothelioma cases are testicular in nature. It is almost fully asymptomatic, and the condition is generally discovered as the patient receives treatment or surgery for a different condition. Usually, diagnosis doesn’t occur until there are noticeable lumps. One of the better things about testicular mesothelioma, however, is that it has a much better prognosis. In most cases, the affected testicle can be surgically removed and patients can be provided with chemotherapy and radiotherapy, which has proven to be successful. How Common Are the Different Types of Mesothelioma? Mesothelioma is, as far as researchers know, caused by asbestos exposure. Pleural mesothelioma is the most common, because the asbestos fibers are breathed in. 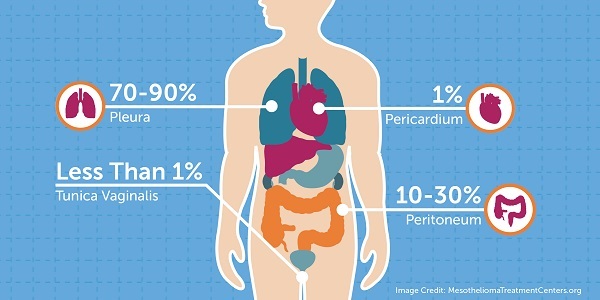 Peritoneal is the next most common due to accidental ingestion. Pericardial mesothelioma is rarer, as it would mean that the particles were able to break free from the lungs and reach the heart. Scientists do not know, however, what causes testicular mesothelioma and there is some suggestion that it may not be related to asbestos. Malignant mesothelioma tumors are the aggressive type that spread and eventually cause full organ failure. Unfortunately, they remain hidden for a long period of time and, once they do become active, they spread very quickly. As such, malignant mesothelioma cancer cells are notoriously hard to treat through conventional cancer treatment such as surgery, radiotherapy, and chemotherapy. The condition is caused by asbestos exposure and has a very long latency period. As such, anyone who has ever been exposed to asbestos should have regular tests completed. Benign mesothelioma is very rare. However, it is also much easier to treat. In most cases, patients can recover fully from benign mesothelioma, but it is more likely that the condition will return later on in life. Lastly, there are different cell types within mesothelioma. Epithelial mesothelioma, which is the most common and is found in between 50% and 70% of all cases. These are uniform cells and have a significantly elongated pattern. As such, it is quite easy to recognize them under a microscope following a biopsy. These cells are malignancies known as adenocarcinomas. Interestingly, these are not common in cancers of the mesothelium, but rather are common in cancers of the lungs. Sarcomatoid mesothelioma, which is not as common. Between 7% and 20% of cases have these cells. Here, the cancer cells grow from muscles, bones, and other supportive structures inside the body. Biphasic mesothelioma is a mixture of both the sarcomatoid and epithelial cell types. The treatment for these cell types is the same as normal, but the prognosis is much worse because of the tissues from which the cells have spread. Papillary mesothelioma is sometimes referred to as well-differentiated mesothelioma. It is most commonly found in women who have had exposure to asbestos. Most of the time, this is found in benign mesothelioma. As a result, it usually does not spread either.